For the next 35 days I am participating in reading the New Testament with my church. Like so many things, I am behind and catching up but am committed in finishing. I downloaded the iphone app, Bible.is so I could listen to it while driving. It only takes about 28 minutes each day to go through the entire New Testament. I have been listening to it in the car, in the shower and just about anywhere! Most of you know I quit my job so I could stay home with my baby girl. We went from two jobs and no kids to 1 job and 1 kid and with that comes all sorts of new fun and new worries. What does that have to do with reading through the New Testament? Everything! That little gal has no worries. She just wakes up, eats, gets her clothes changed, plays, naps and starts the whole process over without a care. So I realize I need to be more like her. 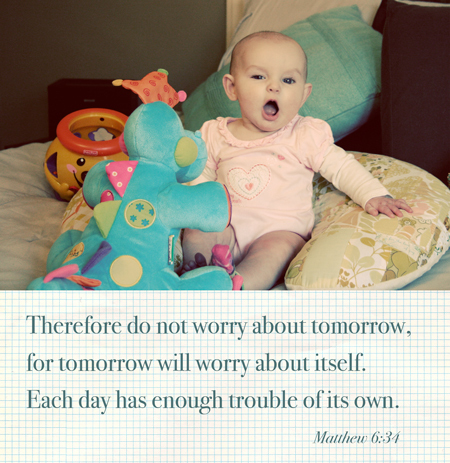 Not worry about tomorrow and just take care of what I can today. That said, I'm off to get some work done!! that is a great verse! that verse constantly plays through my head everyday esp. during weeks when money gets tight since i don't bring home a guarantee check every week! it's so silly of me to worry because He ALWAYS provides! I love that verse! I have no doubts that you'll be able to get it all done!